Photo: Smith-Clark and Smith-Bickler House, ca. 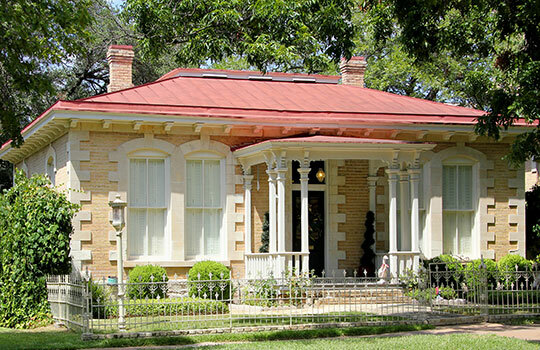 1883, 404 West 14th Street, Austin, TX. Listed on the National Register of Historic Places in 1979. Photographed by User:Larry D. Moore (own work), 2008, [cc-by-3.0 (creativecommons.org/licenses/by/3.0)], via Wikimedia Commons, accessed October, 2013. Travis County Courthouse is located at 1010 Lavaca Street, Austin TX 78701; phone: 512-854-9020. Travis County was created during the days of the Texas Republic (1840) out of Bastrop County; it was named for William Barrett Travis who was a military commander at the Siege of the Alamo. More than a dozen new, additional counties were subsequently carved out of Travis; today, the county covers an area of about 1,100 sq. miles. Today the county is comprised of dozens of distinctive towns, villages and communities, each with their own sub-neighborhoods and subdivisions. Eastern Travis County's rich soil and grassy plains gave rise to a thriving cotton industry. The western county is comprised of numerous limestone hills.